Mama Arisugawa is on a moped trip in Vietnam. As such, Tsukasa works a shift at the bathhouse. While sitting at the front booth, Tsukasa imagines various mangaka coming to the bathhouse. Chitose arrives, demanding to know why Tsukasa is working. Tsukasa puts her off and gets her to take a bath. While in the bath, Chitose notices Aya there. Aya is bemoaning how it is a Monday, but she slept until 11am. Aya asks Chitose if she bought the LaserActive console for Tsukasa, as she had previously stated she’d do. Chitose states that it is very expensive and her allowance didn’t cover it. Aya is shocked that the supposedly rich Chitose, complete with maids, couldn’t buy this classic console. Aya expresses her disappointment, causing Chitose to spray her, calling Aya a disappointing bishoujo character. This causes Tsukasa to enter and spray them both. After their bath, Chitose apologizes. Aya suggests that they play Smash Brothers. Nasa arrives and is surprised to see Chitose. She reminds him that she’ll keep coming until she gets Tsukasa back. She demands to know why Nasa is goofing off while Tsukasa is working. Nasa turns this around on them by asking them why they are here on a weekday.This causes Aya and Chitose to get their game on. Nasa and Tsukasa observe Aya and Chitose play. Chitose is a bit of a tsundere, who’s good in school, but not as good at games. Aya is good at games, but not good in school. However, they form a friendship. Tsukasa agrees to exchange contact info with Aya. Further, she promises that if she does get the LaserActive, she’ll let Aya know. The two go to school, and get scolded for being late. Ha!ha! 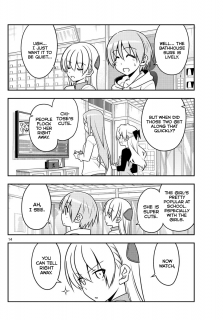 Tonikaku Cawaii chapter 49 shows what Hata-sensei is good at–making a filler chapter about nothing be fairly entertaining. It is funny how friendships can form. With Chitose, you have a cute, tsundere, rich girl who can’t just buy anything she wants. She’s smart and good at school. But because she’s a tsundere, she isn’t going to just come out and say things. And she’s not good at games. On the other hand, Aya is a cute girl who’s not very smart. While she may not have been able to confess her feelings for Nasa, she does otherwise tend to speak her mind. She tends to be lazy on most things except gaming, which she takes very seriously. As such, Aya and Chitose are quite opposite to each other. And yet Tonikaku Cawaii chapter 49 establishes the foundation for their friendship. Frankly, I loved every moment of their interactions. That’s what made the chapter fun, even though it was a chapter about nothing. Not a ton to write about with Tonikaku Cawaii chapter 49 , so I’ll wrap it up. 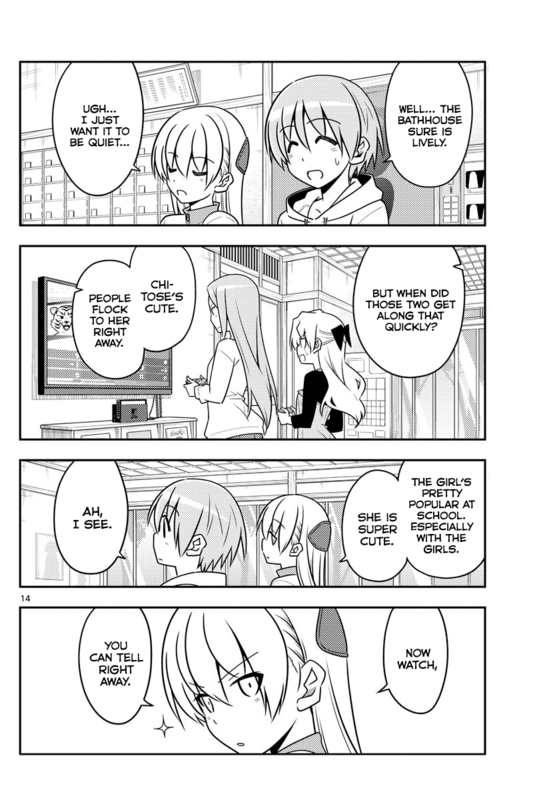 Tama from Hayate the Combat Butler shows up on the TV screen when Aya and Chitose go to play their game. I have to admit that I rather enjoy these little cameos. I don’t get Hata-sensei’s having Mama Arisugawa in Vietnam on a moped trip. I’m guessing this much be a reference to some sort of event going on in Vietnam at the time of the manga chapter’s publishing. In the end, Tonikaku Cawaii chapter 49 is a chapter that is much ado about nothing. And yet it was a fun chapter all the same.